The 2016 Wrangler National Finals Rodeo barrel racing action is now underway with the first go round kicking off 10 days of thrilling rodeo action. Meet the 15 fastest barrel racers of the Women’s Professional Rodeo Association right here and don’t miss the December 2016 issue of Barrel Horse News for the incredible extended stories and bios—both human and equine—that recap each of their incredible journeys to Las Vegas! Stay tuned for nightly go round and WPRA World Standings updates via our Facebook page and barrelhorsenews.com. Amberleigh Moore and CP Dark Moon (“Paige”) concentrated their efforts close to their Salem, Oregon, home, decorating their season with wins in Sisters, Oregon, and Omak and Puyallup, Washington. One run at a time, Moore came closer to a bigger, unplanned reality – her first Wrangler NFR qualification. One run at a time, Moore raised the bar for herself and set an unprecedented threshold of $79,067.98 to edge out two-time NFR qualifier Taylor Jacob for the last barrel racing back number. A scalding round two win at Cheyenne Frontier Days gave Jana Bean the strength and faith she needed to persevere through an emotionally trying season. A special horse named Dashing Klee (“Chick”) carried her though the stress-riddled season. With her 6-year-old horse running stronger and stronger, Bean qualified for her third NFR with $80,335.63 in regular season earnings. Bean will also have several backups on hand at the NFR, among them Brittany Pozzi’s Steele Magnolias, Latircia Duke’s Happy To Run Em and Sadiestominnieshoes. Thomas & Mack Center. Photo by Kenneth SpringerWith major money won in small set-ups like the Snake River Stampede in Nampa, Idaho, Carley Richardson gained confidence in Doda Flit’s hard-earned proficiency in arenas similar to the Thomas and Mack that was her Achilles Heel in 2015. Richardson, who confesses she is “weirdly” superstitious about the socks she wears when she gets on her horse to make a run (the ones with the ducks bring the most luck), finished the season with $80,875.33 to set her up for a second chance at a world title. A milestone for Cervi this year was crossing the $3 million mark in Houston on her adored MP Meter My Hay (“Stingray”). In an effort to preserve her great mare, Cervi got some help from Dena Kirkpatrick’s Easily Dashed (“Sweet”) through the winter and picked up Callie duPerier’s Dash Ta Diamonds (“Arson”) before setting out for the summer. Cervi has eclipsed Charmayne James’ record 19 qualifications, and she makes the trip from Marana, Arizona, to Las Vegas with $83,678.73 in regular season earnings. The San Angelo Rodeo was a turning point for Pamela Capper, kick-starting her road to her first Wrangler NFR. Two years ago, the five-time Columbia River circuit champion gave up her job as a school bus driver in Cheney, Washington, to take a leap of faith and pursue her lifelong calling. On Sheza Smooth Flight (“Jesse”), Capper earned $87,504.75 in regular season earnings to bring into the 2016 NFR. WPRA Rookie of the Year Cayla Melby, daughter of 2013 Wrangler NFR qualifier Jane Melby, rides into Vegas on the strength of $87,736.63 in earnings for her first year of professional eligibility. It didn’t take Melby, a two-time Canadian Finals Rodeo qualifier from Burneyville, Oklahoma, long to profit from the competitive spirit she has inherited from her mother, who taught her that nothing great happens when you hold back. She started winning late in the spring, citing Clovis, California, as a turning point. Winning the San Antonio Stock Show Rodeo was a major highlight for Michele McLeod, who has qualified for the Wrangler NFR for the fourth time on the black stallion, Slick By Design, owned by Jason Martin and Charlie Cole of Highpoint Performance Horses. McLeod left Slick home to rest for the summer and used the remainder of the year to jive with Streakinflingindisco and another Highpoint Performance Horse, Stitchs Honor N Fame. McLeod finished the regular season with $87,744.98 earned. Brunswick, Georgia, cowgirl Sarah Rose McDonald has qualified for her second Wrangler NFR with $89,364.39 in regular season earnings, banked primarily on the crowd favorite Fame Fling N Bling (“Bling”), with some help from the duPerier barn of elite barrel horses, among them Foxys Driftin Jewel (“Jewel”) and Friscos Col George (“Tonka”). Lisa Lockhart balanced her time between the ERA and the WPRA rodeos peaking in key places like Cheyenne to qualify for her 10th NFR. The newly crowned ERA World Champion barrel racer teamed with her beloved An Oakie With Cash and the now 18-year-old Fast N Gold (“Chisum”) to earn $100,224 in just 38 regular season rodeos. The Oelrichs, South Dakota, cowgirl also rode Alan Woodbury’s Rosas Cantina CC during the regular season. 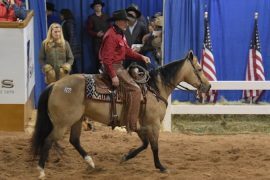 Hillman, an accomplished futurity trainer residing in Weatherford, Texas, earned her first NFR qualification riding her main mount, Cuatro Fame (“Truck”), owned by Jason and Melissa Mouton. When Truck bruised his foot, she called on 5-year-old Morning Traffic (“Martini”), owned by Cody and Michelle Darling. Hillman will enter the 10-round finals rodeo with $104,642.98 to her name. Competing at the Calgary Stampede with homegrown TKW Bullysfamous Fox was a highlight of Kimmie Wall’s regular season. Wall, Roosevelt, Utah, never gave up on her dream. She finished the regular season with $107,795.17. First-time qualifier Ivy Conrado had a commanding lead in the pro rodeo standings early on. Riding the AQHA Horse of the Year and homegrown mare, Cfour Tibbie Stinson (“Tibbie”), Conrado was consistently both smooth and fast, winning Casper, Wyoming; Billings, Montana, and placing second in Denver, Colorado, before rolling into Fort Worth – a bucket list rodeo for the Hudson, Colorado, cowgirl. She finished the year with $111,160.11 to her name. Calgary Stampede reserve champions Mary Walker and Perculatin enter their fifth Wrangler NFR with $112,815.95 in regular season earnings. Walker, who resides in Ennis, Texas, hustled through a busier-than-usual winter rodeo schedule to qualify for the Calgary Stampede. She gained momentum in Denver, Tucson, Arizona, and Houston, earning enough for the Calgary invitation, where she went on to add $35,000 and ascend the world standings. Second-year qualifier to the Wrangler NFR, Abilene, Texas cowgirl Jackie Ganter takes $116,386.69 to Vegas from the regular season. She will also be bringing an arsenal of horsepower. Ultimately, Burger banked more money than any other barrel racer has won in the regular season, capping it off at a total of $190,976.59. She considers her faith in her horse and in God her greatest strengths as the NFR approaches. Not a subscriber? Click here to subscribe to Barrel Horse News magazine!